Add the bail bond calculator to your website. 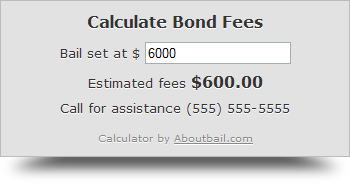 The bail calculator adds a level of trust to your website, converts more visitors to clients, and helps your client understand what their fee will be before they call. You can add a bail calculator to your own website. It's designed to fit almost any layout. Embedding the calculator is easy. Enter your pricing tiers and company info, then paste the code on a web page. For variable rates, add price tiers in ascending order. Click on Preview to see your calculator. Click Generate Code, then copy and paste the code into your web page.